Sure a dog is man’s best friend. But what does that mean on a practical level? Does the human and animal (HA) bond be used for the greater good? Angeline worked with holistic veterinarian Michael Bartholomew for a two-week practicum in November, 2010 in South Salem, New York at the Smith Ridge Veterinary Center. That opportunity gave her the time and experience to define the audience she is working with, and to look at how veterinarians can influence the health of the human animal bond. Then for her master’s project, she used Saybrook University faculty member Jeannie Achterberg as her committee chair, and Dr. Bartholomew as a committee member. Dr. Achterberg is widely known for her research and publications on the use of imagery for healing, but also has a long-standing interest in the bond between humans and animals. Angeline has a private practice called the Zen of Fido, www.zenoffido.com, and specializes in holistic medicine for the human-canine relationship. The following is an example of how she is using mind body medicine at her practice. Mylo and Sasha: Angeline has been working with Mylo, a 2.5 year old Basenji and his owner Sasha, for the past 6 months. During a time when Mylo was under the care of Sasha’s friend, a car and motorcycle collided within 10 feet of him. After witnessing the accident Mylo began showing definite signs of post traumatic stress. He was spooked by average noises, couldn’t leave his home, paced the condo, and was not the same happy go lucky companion that Sasha knew and loved. Sasha initially saw a veterinarian who offered her tranquilizers for Milo. After one day with Mylo on tranquilizers, Sasha knew that this was not the approach she wanted to take with Mylo. She then found Angeline Siegel and started working with her to treat the causes of this anxiety. The following is a sample of what a session included. 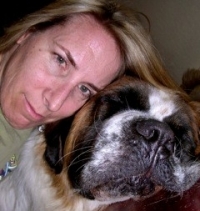 Develop a mindful breathing practice, while massaging the dog. Massage creates bonding, stress reduction, and increases trust between guardian and companion. Where the physical touch and massage are delivered are also important. Sasha and Mylo sit on the floor while Sasha massages Mylo beginning in specific parts of his body. This, combined with the mindful breathing, will elicit deep relaxation breaths from Mylo and the release of oxytocin in both parties. Mindfulness based techniques for Sasha. After two months of therapeutic mind-body work, Mylo made progress toward becoming his “old self” (yes, dogs too have a personality and an “old self”), and Sasha started to cultivate an awareness of how her stressful reactions and larger expectations were affecting her health and well-being. As a result of her time with Angeline, Sasha began to take time to practice her own mindfulness meditation. She also came to understand that her expectations and thoughts affect her interaction with Mylo. Although results take practice, time, and patience, both human and animal learned how to deal more effectively with trauma, and to better control the stress in their lives through mind-body skills. Having a master’s degree has enabled Angeline to distinguish herself from other professionals that are working with animals. She has created a niche for herself in the human-animal bonding field, using mind-body medicine as her primary approach. Angeline received her MS diploma at the graduation ceremony in San Francisco on August 2011. She is now in her first year in the College of Mind-Body Medicine PhD program, with a specialization in research.